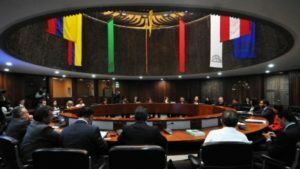 The Andean Parliament, meeting in the city of Pucon in southern Chile, unanimously expressed its “total support” for the Morocco-proposed autonomy initiative for the Sahara as a political solution to the artificial regional conflict. In this context, the Andean Parliament referred to Security Council Resolution 1754 of 30 April 2007, describing the Moroccan autonomy proposal as “serious and credible”. The Andean Parliament, headquartered in Bogota, the capital of Colombia, was set up on October 25, 1979. The Parliament’s Constitutive Treaty was signed by the Foreign Ministers of Bolivia, Colombia, Ecuador, Peru and Chile. The process of Argentina’s membership is underway. This regional legislative institution also includes four observer members, namely Morocco since November 1996, Spain, Mexico and Panama. The institution seeks two main objectives: legislative harmonization through the development of normative frameworks on topics relevant to the region; and the strengthening of the Andean integration process through the setting up of Andean citizenship and the promotion of citizen’s participation in the bloc’s affairs.